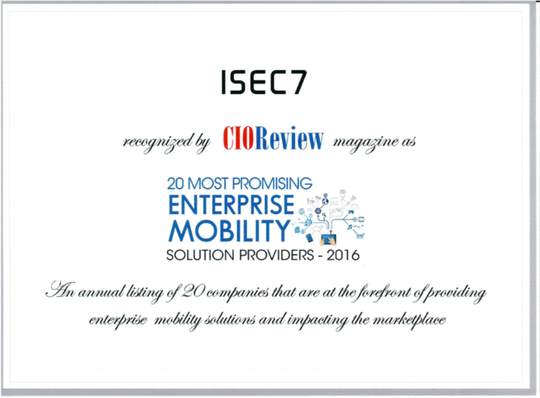 ISEC7 was recognised as one of the TOP20 Most Promising Enterprise Mobility Solution Providers 2016 by CIO Review. The award honours the outstanding work and commitment of ISEC7 in the area of mobile computing, enterprise mobility and the mobilsation of business processes in enterprises. ISEC7's long-term history in the ecosystem, the restless skill enablement of the employees and hundreds of successful implemented projects are a valid proof of this award.